There is nothing quite as romantic as a Tandem bike ride. 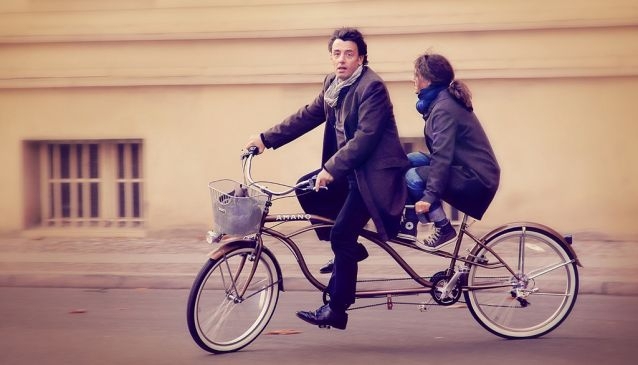 Much more exciting than your usual one person bikes, Tandem bikes are slightly quirky, very novel and oh so romantic. But don’t just stop at the classic one in the front and one in the back tandem. (This, of course, is an excellent ride). Berlin has something called a Buddy Bike where you can sit side by side on a two wheeled machine as you take in the sights. It’s actually not such a new idea as it was around in England in the 1800’s, however it’s not so common these days: two seats, two handlebars, two sets of pedals, two wheels – side by side!!! A tandem bike ride around Berlin is definitely something you wouldn’t do every day, which makes it a special addition to the romantic in Berlin list. There are many castles dotted about Berlin and the surrounding areas but we feel that two stand out in particular for walking hand in hand and exploring a picturesque garden. Pfaueninsel (Peacock Island) and its fairytale like palace sit in the Wansee and are only reachable by ferry from Wansee train station. As its name suggests, peacocks roam the gardens as well as other birds, frogs and in summer, water buffalo can be seen in the river. Up the romance by bringing a picnic and spending the morning grazing, roaming and pretending that you are Friedrich Wilhelm 2nd and his lover Wilhelmeine Enke in 1797 gazing on your newly finished palace getaway. 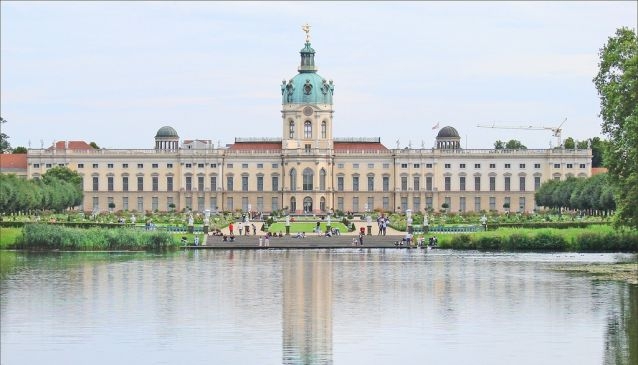 The largest palace in Berlin is Schloss Charlottenburg. Built at the end of the 17th century by many fancy people, one being Friedrich Wilhem 1st, (yes, Peacock Island guy’s dad), this palace and surrounds are vast and impressive. Prepare to have lots of ‘wow’ reactions when you realise how they lived back then. There is lots to see on the grounds, a mausoleum, an orangery, theatre and pavilion, a belvedere, a tea house plus of course the mammoth palace in baroque and rococo style. If you like music there are classical music concerts from April to October or you can dine, have high tea or grab an ice cream before taking in the impressive views. Treating your loved one to a night or two in the Hotel Adlon in Berlin’s Pariser Platz is a wonderfully luxurious way to say ‘I love you’. 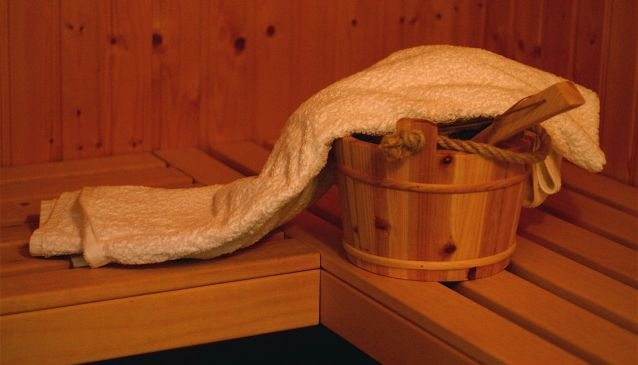 It is legendarily one of the most famous hotels in Europe. First built in 1907 but heavily destroyed in World War Two, it was refurbished and re opened in 1997. 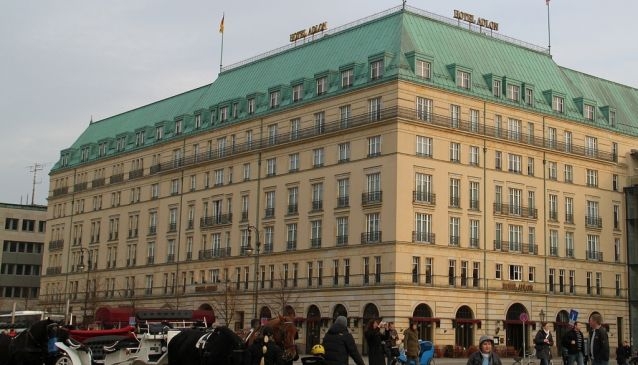 If you want to stay indoors, Hotel Adlon has everything you could possibly need with its limousine transfer from the airport, 24 hour laundry service, smokers lounge, restaurant, room service, luxury spa, salon, pool and gym and an arcade full of boutique shops. You needn’t get out of your robe all day, well, maybe to enter the shops will require wearing pants. Or if you want to explore Berlin, Hotel Adlon can help you reserve tickets to a show, a table at a restaurant, organise an exclusive city tour or tell you the best track to jog in Tiergarten. If you prefer, just let yourself loose on the sightseeing as its located right next to the Brandenburger Tor on Unter Den Linden. 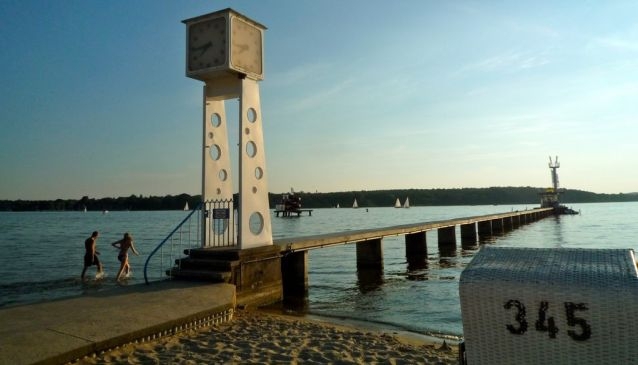 When you are in Berlin, if you are after a cheap run away out of town day trip, take your loved one, sun screen and a basket of food to Europe’s largest inland beach, the Strandbad Wansee (Wansee beach). Sit and relax on the sand, frolic in the waters or rent a deck chair, umbrella or paddle boat to really get the beach feeling. There are facilities there as well as a restaurant and playground, plus, a family friendly area where being naked is the attire of choice. Strandbad Wansee is definitely a popular location in summer so best to go earlier in the day and it’s nice to get out of the city and enjoy Berlin’s surrounding parks and lakes for a change. 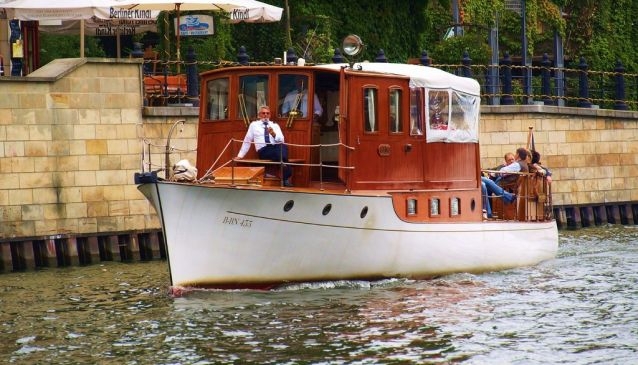 Make a special boat tour even more romantic by hiring a private boat and guide to take you down the river Spree, the Wansee or any of Berlin’s other picturesque locks and canals. You can have your own private Berlin boat experience with a 3 course meal, champagne, snacks, and English tour guide. 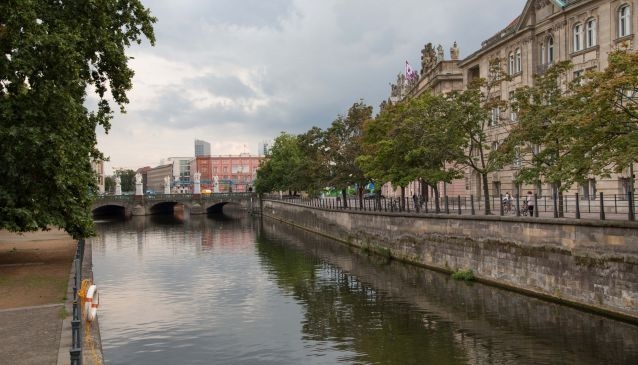 If you are used to exploring a city by foot or bus, boats are a nice, different and relaxing way of seeing the city and is an experience to treasure afterwards. A private tour may start from costing a few hundred Euros then adding your extras like personal guide, drinks and food will bump up the price. But you pay for a good 2 hours worth of travel, information and good times floating down the serene river Spree with your sweetheart. A night at the theatre is a great way to get dressed up and take your date on the town. Start with dinner at a nice restaurant in Mitte then head to one of Berlin’s three main opera houses to take in a show for the evening. 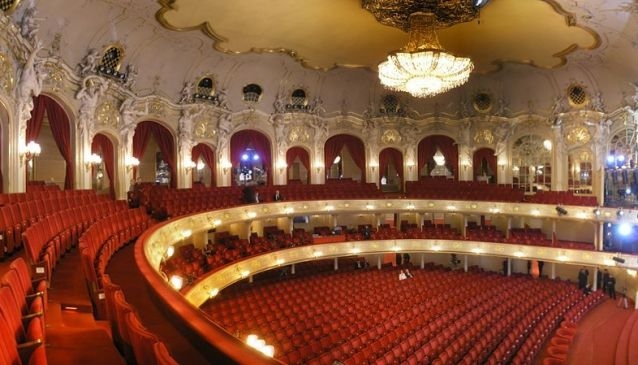 The Deutsche Oper Berlin, Staatsoper im Schiller Theater and the Komische Oper are all regarded as some of the best A-list opera houses in the world and will have any number of opera’s running simultaneously for you to take your date to. A night at the opera or watching the city’s ballet company, The Staatsballett Berlin, perform is a night to remember as you’ll be watching history in the making in one of the most cultured cities in Europe. High tea is a typically English experience but we have found a good spot in Berlin where the German’s do it too! 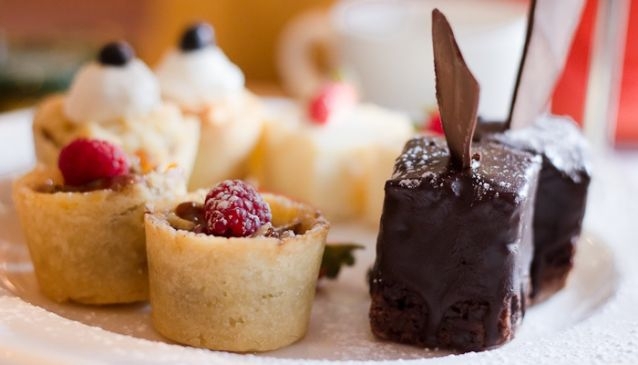 And who doesn’t love a good High Tea, right? The Ritz Carlton Hotel in Postdammer Platz offers an exquisite high tea as you sit in the decadent Tea Lounge and listen to the live piano shenanigans as you eat your scones and cucumber sandwiches. After 6pm you are welcome to stay for a cocktail or two in the lounge or move to the hotel’s impressive Curtain Club and drink your beverages in a bit more evening style. 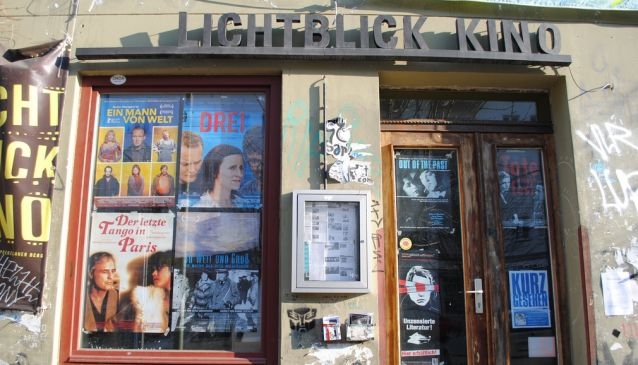 Take in an old movie at the Lichtblick Kino in Prenzlauer Berg. This quaint cinema screens old German and other original language films with various subtitles. On the weekends, see black and white films made about Berlin with English subtitles, like their Film Of The City series including ‘Berlin Alexanderplatz’ made in 1931or ‘Der Himmel Über Berlin’ (The heaven over Berlin/Wings of desire) from 1987. But a great date night might be to take in a late screening. On a Saturday night, after you’ve had a nice meal at the Berlin dance hall institution that is the Gipsy Restaurant at Clärchens Ballhouse in Mitte and then a drink at one of the many cool bars on Kastanienalle, head to down the road and take your special date to see a late show of the classic film ‘Casablanca’ in its original language. A nice and cheap romantic thing to do in Berlin is take in the sights. The river Spree runs for 400 km so it’s bet to pick the nicest part in central Berlin. If you take a stroll along the picturesque section between the Berlin Hauptbahnhoff (Berlin main train station) and Mitte’s Museumsinsel, some may say it’s (almost) like being in Paris....ok, perhaps it’s not quite the Île Saint Louis on the Seine but it’s definitely a nice stroll as the sun is setting. Finish it off with a wine or a cocktail at one of the funky bars located at Monbijoupark. Sit either in the chairs out front, or take your drink to the grass and watch the river and the people go by whilst gazing at the Museumsinsel as the sun sets.